We finished up a few projects today. Dale has been working most of the day on getting our records ready for our tax prepared, this has to be the earliest that it's ever been done. All she's waiting on is her W-2s, everything else is in. Today I worked on putting the railings on our "porch". Just a hand rail on the steps and a rail across the front, one side is open for the dogs' ramp. We also now have a "deck light" under the edge of the "porch" to light up the ramp area at night. I also hooked up the phone connection to Dale's parents new park model. I found the connection under the rear corner Thursday. After buying some phone line splices, I ran the line under the park model today. Now they have three phones instead of just the one that was connected on setup in the bedroom. Time for dinner, see ya. That's what the boyz and I are doin' tonight! Neal's asleep and appears to be much better, while Bailey's licking a toy. So it was time to hijack this thing again. Dale's off to her French Class at the recreation hall, so she'll be back later, hopefully in time for tonight's edition of "24". Today Dale and I went to a RV.Net gathering at the "Horseman Grill" north of Weslaco. We stopped by Victoria Palms and met up with Dave, Sandy and Max 'The Wonderdog" on the way. After some making over Max, Dave and Sandy followed us over to the Horseman and spent most of the afternoon with us. 140+ RV.Net forum members showed up for lunch, talk, a presentation on RVing in Mexico and music. It was nice to see so many of the "Winter Texans" again, that hang out on-line. Tomorrow night is Bingo Night, so Dale will be gone again. Just me and the Boyz, wonder what we'll do then? We got to bring Neal home around 7 p.m. last evening. He looked really good and was sitting up in his cage. Unfortunately, he is having problems with diarrhea; fortunately that had necessitated a bath at the vets, so he smells pretty fresh! The vet thought he would do better at home. He wasn't eating a lot there, but he wasn't able to go out to potty or pee either. The first thing he did when we got him home was to pee a gallon in his new Potty Patio. I had to feed him something because he needed to take his meds, so I gave him some of his Science I/D the vet sent home. He wasn't too enthused about that, but ate the tiny piece of braunschweiger I put his pills in. I'm thinking several things could upset his GI trac. First, it was cut open, and they have had him on IV's up until yesterday morning. Also, they have him on antibiotics and that can do it as well. I slept with the dogs out in the living room last night and about 2 a.m. Neal barked at me. So I got up and let them out. Neal was still having his problems, but he still got the job done and we all came back inside. At least he is letting me know when he needs to go out. They both slept until 7 a.m. this morning until I got up and started stirring around. We took them both out and then brought them in to feed them. Neal ate well . . . I only gave him a small amount. He is to have several small meals. He is back in his pen as we want to keep him confined for a few days. Neal will also get fitted for a cage/basket muzzle today. 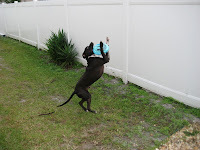 Other parents of rock-eating dogs have told me this is what they do to keep their dogs safe. One family has a bassett hound who has had two surgeries for rocks and two other times he has passed them. I wish someone had suggested it to me before. Since we full time, we cannot control his outdoor environment, so it necessitates alternative action. Bailey really seemed glad to see Neal. He is perkier than he has been and seems to be doing better and getting over his bronchitis. His thyroid tests came back negative, so we are probably going to have to test for Cushings once he is off his steroids for awhile. Last Friday I finished up with my month of physical therapy. I elected not to do more, not because it wasn't helping, but because my therapist established a "home program" and she is confident I will be able to continue it with similar results. It has been a good journey because this therapist is a jewel. She is so much better than the one I had in Indiana who didn't have a clue as to the type of back problems I had and just put me on machines for 45 minutes. This therapist, Patti, did stretches to specifically target the muscle that is torn in order to get the maximum use of it. And at the same time, taught me the exercises to support my back, since the two problems require attention at the same time. I have to return to the doctor on Wednesday, but I should be done at that point. So, things are slowly returning to normal. Looks like we will be staying close to home for the next week or so until the dogs get back on track. Neal's surgery was this morning and he seemed to tolerate the procedure well, woke up and was resting comfortably at the time Dr. Fuentes called. In addition to the rock, he had a piece of plastic in his upper small intestine. It was sharp and jagged and hard enough you could break it. Hard telling where he got this. Since the incident 2 years ago, we have been extremely diligent (apparently not enough) and as we worked on our lot here in Texas, took out smaller stone and put in larger rock just so he wouldn't do that. It was one of the "smaller" larger rocks. The vet is concerned about the intestine surgery as it is a source of bacteria, etc. She took some connective tissue from around the stomach and wrapped it around the sutured intestine and they will do the IV thing for a couple more days instead of giving him solid food. They will closely monitor his temp and probably do some injective seizure meds since he won't be getting his normal ones. BUT, while she was in there, she saw multiple lesions on his liver. . .like little buttons on the surface of the liver and a different color. She said the liver felt good, but the lesions were definitely abnormal. She removed some for biopsy and we know they can be benign, as well as not. He did have some abnormal liver results in his bloodwork. So now we wait and see how he recovers. He did well the last time, but that was 2 years ago. 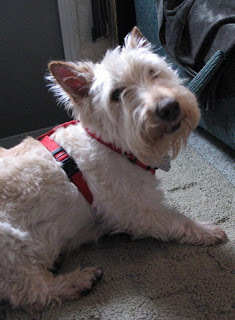 . . he is 13, and this time had the liver biopsy (ouch). We will go see him tomorrow. Yes, we are going to enroll Neal in a 12-step program. I can just hear him now. . .
"Hi. My name is Neal and I like to eat rocks. My Mom says I have to quit but I need help." Not to be outdone by Bailey being sick, Neal swallowed a rock and started exhibiting problems Sunday night. He was only mildly symptomatic, but Tuesday morning he refused his breakfast and any water. So off to Bailey's new vet we went. Fortunately even without an appointment, we only had to wait about an hour and we got to see the same vet who saw Bailey a few days before. She wanted to keep him and do xrays and blood work, so we left him there. She called later to tell me my suspicions were true and he had indeed swallowed a rock, so we scheduled surgery for this morning. She wanted to rehydrate him overnight with IV fluids. I just received a call from the vet's office and the doctor was closing him up right then, but wanted me to know that she did get the rock out and he also had a piece of hard plastic in his small intestine which she removed. In addition he had multiple nodules on his liver so she removed one and I approved them sending it off for biopsy. That way if he has problems again, I shouldn't have to subject him to another biopsy, we will just go with available information, since he is 13. We are hoping for a full recovery for Neal. He will remain hospitalized today and we may get to bring him home tomorrow. That works great for us since we are having our street dinner today and we are working hard. Taking a break right now, but lots of work ahead. Thanks to daughter Jocelyn, I have a better picture of Bailey to post. It's hard to get a good picture of Bailey because he is afraid of cameras. This we believe to be a throwback to his early life when he was abused. He is terrified of flashlights and he equates the flash of a camera to a flashlight, so you cannot take a picture of his face. He runs whenever you point a camera at him. So this is the best I can do of the pictures I have of him. Bailey, our 13 year old Scottish Terror, has a patch of hair loss on his back above his tail. I called their vet back in Indiana (we are in Texas) and since the spot is getting bigger, they told me he needed to see a vet. So I asked around and found a place to take him that several people had recommended. Dr. Fuentes seems very competent and took care to examine Bailey quite thoroughly. She did blood tests for thyroid for which we will have the results next week. She also did skin scrapings. His skin is very dry, lots of dandruff type flaking. I said he had been coughing a bit, so she listened intently to his lungs; and, unfortunately, there is something going on in there, probably bronchitis at this point. He had pneumonia 2 years ago and it was pretty well advanced before I realized he was so sick. At least we caught this very early and began treatment immediately. Then the blood work came back and his liver tests are elevated, a symptom of Cushings, along with hair loss, excessive urination. I had forgotten he had an accident last week in the house, but didn't think it was urine because it didn't smell. Alas, diluted urine is common in Cushings. So Dr. Fuentes talked with me about Cushings symptoms, etc. She said the treatment she is giving Bailey for his lungs will be aggressive and can cause increased thirst and urination, so it will be hard to separate the symptoms of Cushings for the side effects of the treatment. But once his treatment is over, I need to watch carefully to see if he continues to exhibit symptoms. If so, we will have to investigate further. Cushings is treatable and even though he would have it for life, the meds are easily tolerated. He doesn't look sick at all. He is 13, but still a fiesty little Scot. Dr. Fuentes was amused by his "totally terrier" demeaner. He did well with the doctor. I did take and use his cloth muzzle, which he tolerates but doesn't like. He got a treat for being so good. As you know from the "blogger hijacker," Mom and I were in San Antonio to see my nieces and their families who had gone there for a week's vacation. The first picture is my niece's husband Rod with my Mom and his two daughters, Kirsten and Kira. It was a great couple days and we were glad we got to see them. We went out for dinner at the Saltgrass Steak House and went to see the Alamo and drove past the Alamodome. We enjoyed lounging around the condos as well. Mom and I drove back from San Antonio on Tuesday afternoon. It was a long drive home, but it was an easy drive. The only snare we had was when I was driving along on 281 headed south and started noticing debris on the roadway. It looked like insulation. As we drove on, I noticed a flat bed trailer being pulled behind a pickup making its way to the side of the roadway. Just then I noticed a tire rolling down the highway. The guy was out of his truck and attempting to make his way to the tire which was rolling along the inside lane. Not knowing where that tire was going to go. . . I know it was in a straight line, but all it had to do was hit a rock and it would bounce over in front of me. I slowed down and was almost to a stop when I came up even to the tire, so I went on past. It actually was just the outside tread. It had apparently been laying on top of the debris on the trailer. Talk about an upsafe load! Mom and I were tired from our drive home, so we made the guys take us up to Granny's for supper where we got burgers and onion rings. Good stuff. The next day we went to see our friends Tab and Deanna who were staying with friends at Retama Village. They had planned to be here through the weekend, but their dog Major developed problems with an abscessed tooth. They had been treating it, but the abscess appeared to be getting the upper hand. . . er paw. Poor Major's face was swollen and he didn't want to eat anything, so they made arrangements to get him into the vet on Monday and were heading home on Thursday. Good luck with that tooth, Major! While we are on the subject of Man's Best Friend, here's an update on Max, the wonder dog I had written about earlier. His owners rushed him 1400 miles back to the states in 40 hours from Central America after a vicious dog attack left him fighting for his life. He was admitted to the Border Animal Hospital in McAllen. After several days and getting stabilized, the vets performed hopefully his last surgery (I think this was #3), putting in drains, 200 stitches, and closing up his hide where he had gaping holes. The drains have since been removed and he is healing at home. It has been a hard road for little Max, but that indomitable Border Collie spirit is holding true and he wags his tail to greet new visitors and even other dogs. Hopefully once he heals from these wounds, he will be back to playing frisbee and chasing balls. We enjoyed a spaghetti dinner last week. The various "streets" here in the park host dinners in order to raise money thereby keeping our yearly park dues down. Our park fees have to be among the lowest I have seen and this is one way to keep it that way. Terry and I will be helping. Jobs are not assigned, other than EVERYONE must come at 8 a.m. to peel potatoes. We will be peeling 150 pounds of potatoes. Our dinner consists of roast pork loin, green beans or corn, mashed potatoes, applesauce, cake for dessert, and coffee or iced tea. Not bad for $5. Mom says the pork dinner is about the best, but that spaghetti was very good. Last month we had a lasagne dinner which was very good as well. The weather has been nice. We have been swimming in the pool a couple nights a week, riding our bikes, and visiting with Mom and Dad. I have been going to physical therapy three times a week. It has helped me immensely. The therapist has determined that I have about one-third of the gluteus medius muscle on my left side, the other part is torn and no longer functional. Our goal is to make that one-third do as much as it can with help from some other minor muscles. Terry bought some wood yesterday and he is planning on building our "deck" outside the motorhome door. It won't be large, but will be a platform we can step out onto and from which we can assist Neal better. We had a cold front come through yesterday and it is just in the 60's today. It gets warm in the sun, though, and I had shorts on for awhile; but I'm back to my jeans now. Dale and her mom are on their way to San Antonio to see Dale's nieces. I'm here with the Boyz, Bailey, Neal and Dale's dad Dale, supervising their activities for the next few days. Needed something to do, so I hi-jacked the blog! Hope they have an uneventful trip up US281. Max and his human parents made it back to the Rio Grande Valley today. Max is in the hospital and the vet said his wounds will take some time to heal, but he believes he will be okay. His parents went home to sleep for 2 days. New Year's Day was move day for Miss Phaeton Place. We first went to the hall for New Year's Day lunch, which was ham and bean soup or turkey noodle soup made from the leftover ham and turkey from Christmas Day Dinner. In addition, you got a ham or turkey or egg salad sandwich, crackers and peach cobbler for dessert. All this for $3, oh and coffee or iced tea. What a deal! We came home and napped a bit, then changed clothes and went out to wash Phaeton Place. What a job, because any time we move after sitting awhile, I have to clean. Just hate to close those slides in on dirty floors. Also, we had a hydraulic pump for the passenger side slides that had been leaking fluid and Terry had to attend to that. The reservoir was almost empty and I had bought some fluid at Camping World a couple days before. When Terry had inspected it earlier, he thought the cap had jiggled loose on the tank instead of actually having a leak. He did get it filled up and so far it hasn't leaked again. It took awhile to get the motorhome washed and all the bugs removed from the front, but boy does she shine up nicely. We then fired up the engine, took up the jacks and moved her over to the new pad. We have a nice large patio now, but hope to get it all under the cover of a canopy before the hot spring weather hits. In the pictures, you will see our truck and Mom and Dad's car parked on the patio. We have those there right now because the sun shines from the south and they are able to shade the dog's pen. That will change once we get shade. Also another year we will add a Texas room on the far side opposite the motorhome so that we can relax there and we will also have some storage area. Terry plans on making this an L-shaped building. We have some solar lights we need to relocate because they are under the slides now and not getting any sun. We still have work to do, but the biggest part is done for now. The awning will be done by someone else, so we won't have any work involved there. Jax is learning some basic commands and how to "shake paws." 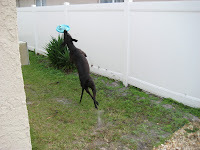 Brandon is successfully teaching him to play frisbee. He is having some trouble with the leash training, but at 3 years old, Jax is going to have to learn something new. He will get it. . . just takes time. I'm glad that Jax has a second chance to live a great life with Brandon. PRAYERS NEEDED FOR DOG MAX! 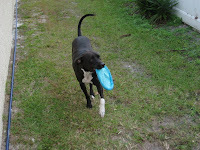 Some of you in our "Graduating Class of 2005" remember a friend/class member Dave with frisbee playing dog Max. Dave and Sandy were traveling in Belize when Max was savagely attacked by 5 guard dogs (on Christmas Day) who were not supposed to be out during the day. Max did not appear to have internal injuries and was taken to a vet immediately, but it appears he got substandard care. They found another vet who treated him and placed him on stronger antibiotics, but infection has developed and Max is in grave danger. They started north to the states Thursday, driving 15 hours, stopping for 5, then driving 400 miles yesterday before stopping to nap. Max's condition continues to deteriorate and they are hoping to cross the border into the Rio Grande Valley today and get him to the Border hospital for what they hope to be lifesaving care. He is very critical and I hope that he survives for treatment and that Dave and Sandy stay alert and safe from harm. 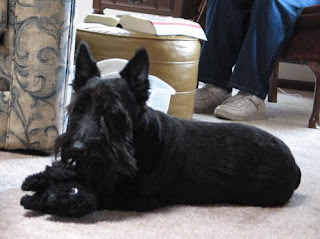 For a picture of Max, you may go to my blog of February 17, 2007. I couldn't link the picture of Max, but you can see him there.